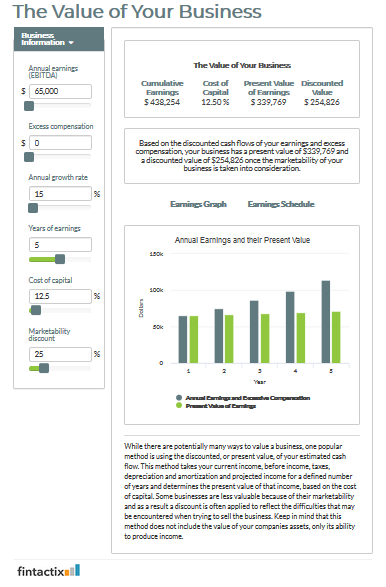 A simple calculator consisting of annual EBITDA, excess compensation, annual growth rate, years of earnings, cost of capital and marketability discount. The calculator has also a visualization of the result, projecting annual earnings and their present value – and can be seen in a table format by clicking “Earnings Schedule”. Black Hills Federal Credit Union provides many calculators to different purposes on their website, ranging from business to savings related calculators.